Outlook Duplicates Items Remover software is designed to eliminate the duplicates from desired PST file items like contacts, emails, calendars, journals, etc. Moreover, the software erases duplicates from All PST files and successfully compatible with any Outlook edition i.e., Microsoft Outlook 2013, 2010, and all previous versions. 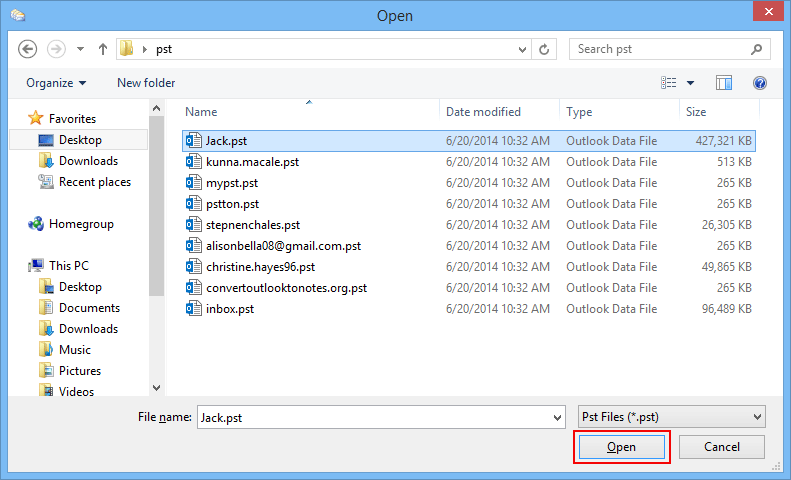 End users able to select more than one Outlook PST file from the software panel itself. Moreover, this tool will allow a user to remove duplicates from more than one PST files, at a time and hence, it will save the time. The Outlook PST Duplicate remover gives two option i.e. eliminate duplicates within the folder or remove duplicates across the folder. Such options provide an ease to a user for easily deleting the duplicates from the particular file, as per their need. 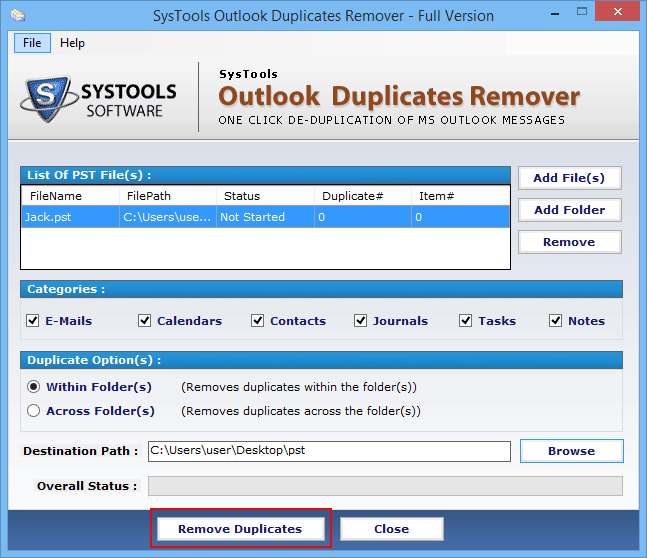 If a user wants to remove duplicates from desired Outlook item, then, he can do the same by selecting that item on which deleting operation is to be performed. This facility is provided by this utility. After completing the selection procedure, the software will generate a list that contains the PST file, those were selected by an end user. They are able to review the selected files at once and then, proceed further. 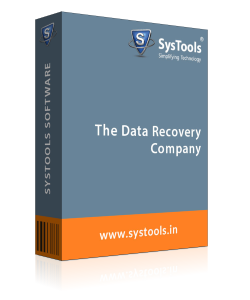 With the help of outlook duplicate items remover software, users can easily browse the location where they need to archive the resultant Outlook PST file without duplicates. Also, the tool gives an option to design a new folder in order for saving the resultant file within it. For running the product, Microsoft Outlook must be properly installed and configured on the machine where the application is to be utilized. Also, it is necessary that users have to set the Outlook application as default email client on their local machine. 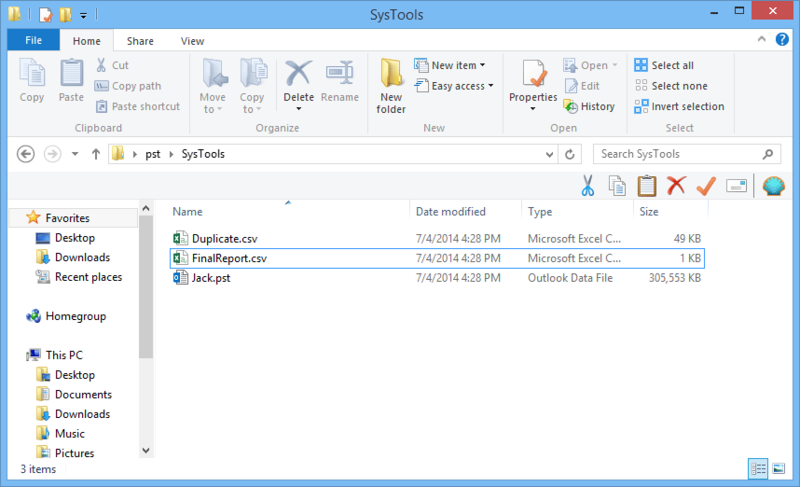 This tool also supports Outlook 2013, 2010, and all below versions. Yes, this utility will allow users to eliminate the duplicates from PST files at a time without any data loss. Q. 2. Does Outlook installation required on the machine before using this software? Yes, installation of MS Outlook on users local machine is mandatory. Q. 3. 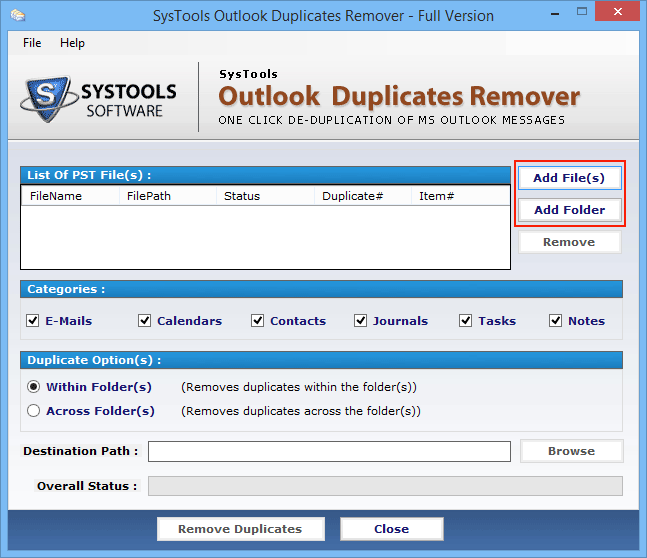 Can I able to remove a multiple number of emails using Outlook PST duplicate remover tool? Yes, Outlook duplicate items remover application is capable of eliminating more than one mail without any inconvenience. Q. 4. Is there any limitation imposed on the product to restrict the size of Outlook PST file? No, there is no file size restriction on the software. You can delete Outlook PST file of any size without any limitation. 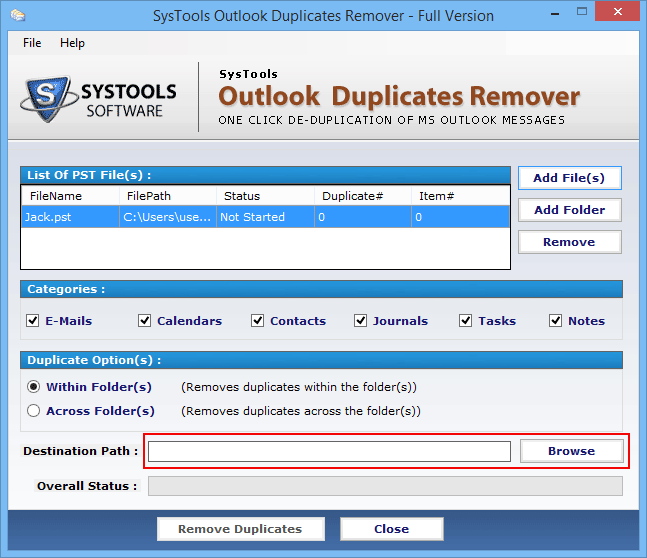 How to remove Outlook Duplicate Emails? 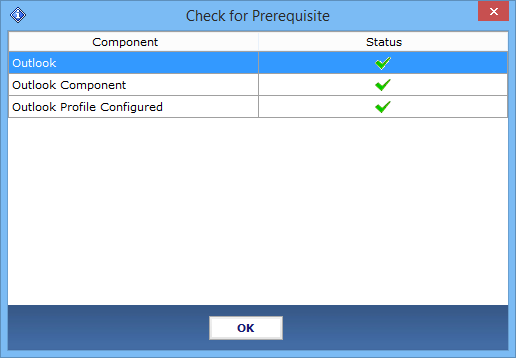 Step 1 : Prerequisite Checking. Step 2 : Launch the Outlook Duplicate items Remover. Go to the Start button » Programs » Outlook Duplicates Remover Software. Step 3 : To remove the duplicates from the specific PST file, click on "Add File" option. You can also click on "Add Folder" option, to select numerous PST files. Step 4 : After clicking on the Add File(s) button the following screen will display. Select the file and click Open button to open the selected PST file. Step 5 : Click the check boxes arranged in the Categories section for eliminating Outlook duplicate data, from multiple emails, calendars, contacts, tasks, journals & notes. Step 6 : Else choose the Within Folder radio button to remove outlook duplicates from folder or the second radio button option use to delete duplicates across PST files folder. Step 7 : Browse the storage Location where you want to save the MS Outlook PST file eliminate duplicates. 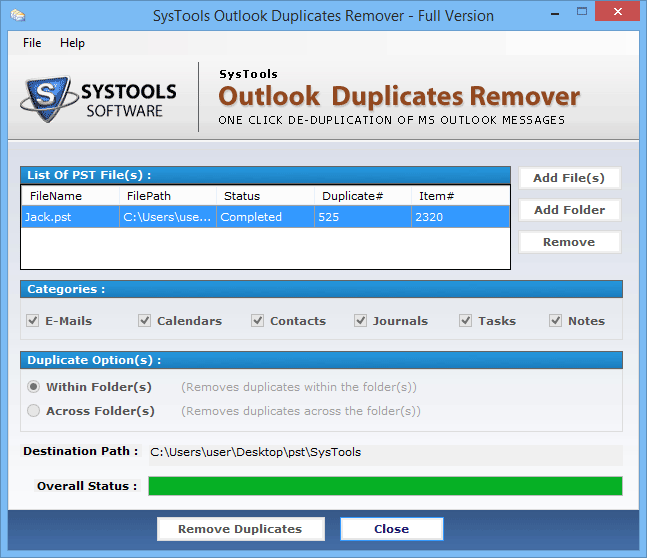 Step 8 : Start the remove outlook duplicates process. So click on "Remove Duplicates" option to initiate the process. Step 11 : You can see the Complete Status of Outlook Duplicates Remove process in CSV format file. I was exhausted from other software to eliminate the outlook duplicates emails from multiple PST files in bulk. All of sudden, one of my friend suggested about this reliable tool, which is widely used to remove duplicate items from a PST files. Now, I am able to accomplish my task by using this utility. I will recommend it to every user those who might experience this type of issue. Thanks for great efforts. 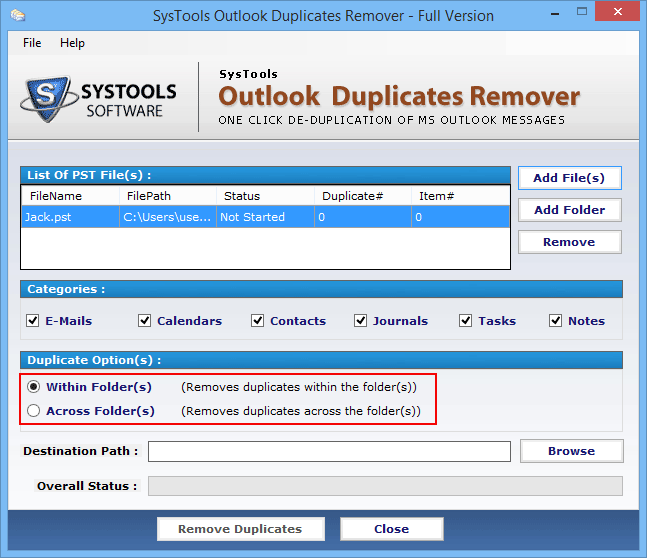 Appreciate the work of the developer’s team who has discovered Outlook Duplicate Items Remover Tool. It will provide the dual option to remove the duplicates such as within or across the folder. These 2 options provides facility for removing the duplicates files. It was a nice experience to work with this Duplicates Removal tool. Thanks a lot.